Although video poker does require some human input, it is still one of the easiest casino games out there. Regardless if you’re playing online video poker or video poker at a land based casino, this article will teach you exactly how to play the game. We’ve broken this article down into two parts: online and live. Read both parts to learn how to play video poker regardless of your setting. The first game we’ll go over is online video poker. 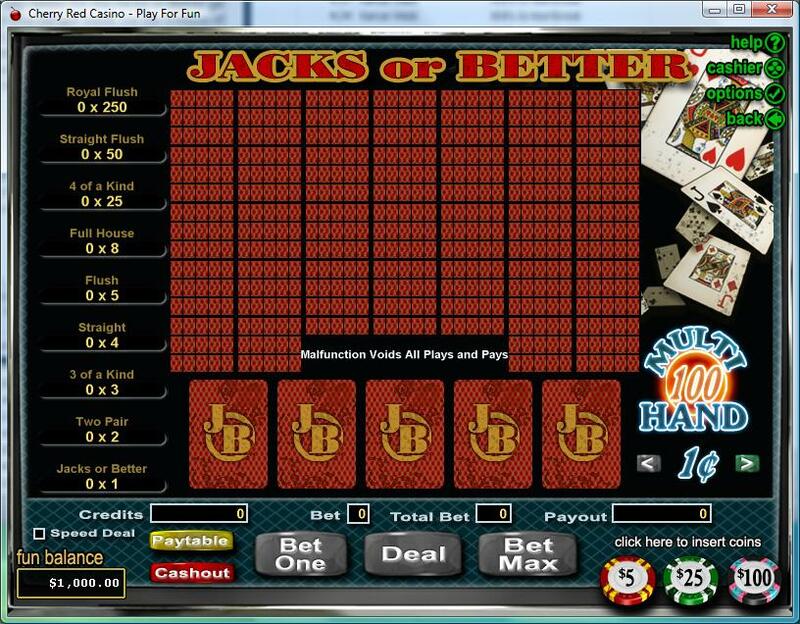 To play video poker online, you first need to choose one of the best video poker casinos. Once you’ve decided on a casino, you’ll have to download the software, install it on your computer, and create your player account. Once that’s done you can open up the online casino software, and choose the Video Poker game of your liking. 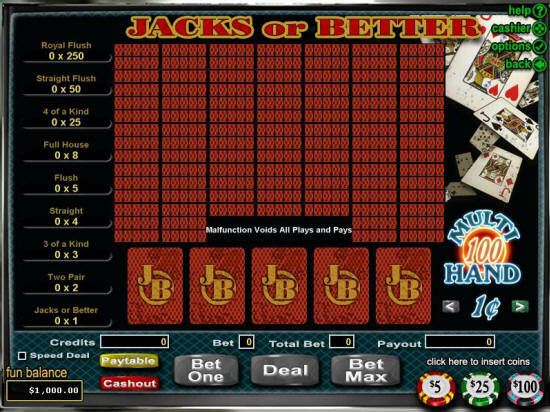 For the purpose of this article we’ll be discussing the most basic video poker game: Jacks or Better. Here’s what a Jacks or Better machine looks like at Bovada Casino. Now we'll go over how to actually play video poker based on the machine above. Your first task is to insert money into the machine. You do this by clicking the three chips in the bottom right of the machine. There is a $5 chip, a $25 chip, and a $100 chip. Click them to insert your money. The next thing you need to do is decide how much money you'd like to bet per hand. You do this by deciding on a credit size, and also by deciding how many credits you'd like to bet per hand. On the machine above we're playing with a $0.01 credit size, as indicated by the 1c in the bottom right corner of the machine. You can click the left or right arrows to increase or decrease your credit size. The next decision you need to make is how many credits you'd like to bet per hand. We always recommend betting five credits per hand, because you'll receive a significant bonus if you make a Royal Flush while betting five credits. If five credits is too expensive for you, we recommend decreasing the credit size until you can afford to play five per hand. Once your bets are selected, click Deal to start the hand. You’ll receive five cards. Your next step is to decide which cards to hold, and which to draw. To hold a card, click it. Click all the cards you’d like to hold, and then click Draw to receive your new cards. If you won, you’ll receive a payout, and if you lost, you’ll be able to start a new hand. That is basically all you need to know to get started. We'll now describe each button on the machine, so you know what everything means. On the left side of the screen, you can see the pay tables for the Jacks or Better game. The pay tables change depending on how many credits you bet per hand. On the bottom of the screen, you see four counters: Credits, Bet, Total Bet, and Payout. Credits is how many bets you have in the machine – if you were playing $0.01 bets like in the example above, each credit would be worth a penny. Bet is how many credits you are betting on the hand – you can bet between one and five credits. Keep in mind that payouts for a royal flush are much higher if you play five credits instead of one-four. Total bet is your bet number multiplied by how much you’re betting per credit. In the example above I’m betting $0.01 per credit, and you can change that by clicking the left or right arrows on the bottom right of the screen near the $0.01 button. Payout displays how many credits you win when you win a hand. At the bottom left of the screen there are two more buttons: Pay Table and Cash Out. Pay Table displays the full pay tables for one bet, two bets, three bets, four bets, and five bets. Cash Out lets you withdraw your remaining credits that are in the machine. At the very bottom left you can see your total bankroll, and there’s also a check box for Speed Deal. If you select this box, you will receive a new hand as soon as the last one ends. The machine will automatically bet the same amount you bet last hand. Finally, there are the three action buttons at the bottom middle of the screen: Bet One, Deal, and Bet Max. Bet One lets you increase your bet one at a time. Deal starts the hand. Bet Max bets five bets, and starts the hand. After the hand starts, the Deal button changes to Draw. After you’ve selected what cards to hold, you click Draw to receive your new cards and see if you’ve won. Live video poker is basically the same as online, because the machine will look the same and perform the same. The only differences at a live video poker machine is that you can insert your player card to receive rewards, and if you hit a big score you’ll most likely have a floor man come over to verify it and pay you out. It’s customary to tip floor men when they pay you out a big score – typical tips are 1% for a huge jackpot, and 3% for a smaller jackpot. Now you know how to play video poker, online or offline. If you’re ready to hit the machines, we recommend signing up at CherryRedCasino.com, as that is the casino we used for this tutorial.